Note: Crew had no assigned Radio Operator (8) or Waist Gunners (9)(10) with whom the crew flew on more than a few missions. 1Lt Amon E. Earhart (P) - Original CoPilot with the Capt John A. 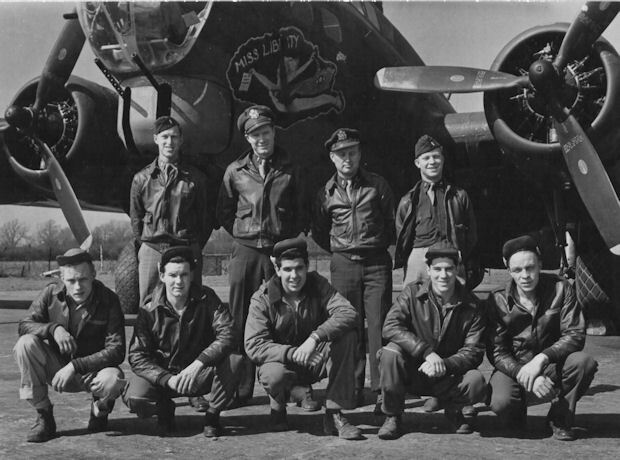 Long Crew assigned to 360th BS on 27 October 1943. Flew 15 missions as CoPilot with Captain Long (82, 83, 86, 88, 89, 92, 93, 94(AS), 95, 97, 100, 101, 102, 103, 107). Flew as a Lead Crew Tail Gunner/Observer on two missions (120, 124) and as a CoPilot with 2Lt Charles D. Crook (110) and 2Lt Joseph E. Stevens (125, 126, 127). Was upgraded from CoPilot to Pilot on orders dated 6 March 1944. Flew as a 1st Pilot on nine missions (130, 136, 137A, 139, 140, 141, 146, 150, 151). Completed his combat tour on 11 May 1944. See the Captain John A. Long, 1Lt Joseph E. Stevens and 1Lt Charles D. Crook crew pages.